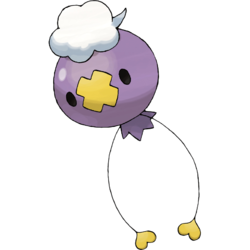 Drifloon in game: 2,259 Who? Important notice! Pokemon Drifloon is a fictional character of humans. Drifloon (Japanese: ???? Fuwante) is a dual-type Ghost/Flying Pokémon introduced in Generation IV. Due to its aimless drifting, this species is known as "Signpost for Wandering Spirits". It has been known to steal children that mistake it for a regular balloon. However, due to its light weight, it can be resisted easily and is often pulled around. Although breed by lost spirits of Pokémon and people, as seen in the anime, it can be friendly and helpful. It prefers to reside in damp, humid locations and can expand or shrink to express its feelings. Fantina appeared with her Drifloon in Playing The Leveling Field!, and it evolved into Drifblim while battling Ash's Pikachu in the episode. 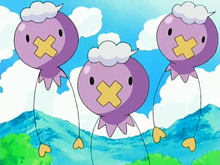 Drifloon first appeared in Drifloon on the Wind!, where many were the friends of two young Joys. 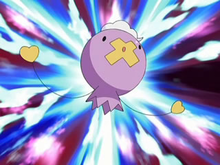 A Drifloon belonging to Kylie appeared in A Full Course Tag Battle!, in which it was used alongside Roman's Girafarig in a Tag Battle against Dawn's Piplup and May's Blaziken. Multiple Drifloon appeared in Foggy Pokémon Orienteering!. A Drifloon made a brief appearance in Coming Full-Festival Circle!. Four Trainers Drifloon appeared in Alola to New Adventure!. A Trainer's Drifloon appeared in The Guardian's Challenge!. Two Trainers Drifloon appeared in SM006. It appeared in the Diamond & Pearl chapter when the trio were in Valley Windworks as a friend of the worker there. In the Japanese version of Pearl's Pokédex entry, Drifloon specifically takes children to the "world of the dead" (Japanese: ??? ), instead of just trying to "steal them away" as in the English version. 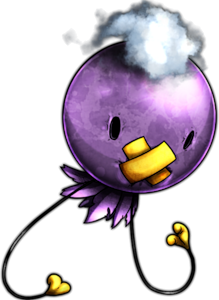 However, in the US release of Super Smash Bros. Brawl, the description along with Drifloon's trophy still states that it is "taking children to the underworld". Drifloon and Drifblim are the only Pokémon not introduced in Hoenn to be found in the Fluctuating Experience Group. Fuwante may be a combination of ???? fuwa fuwa (soft, airy and light, or an onomatopoeia for floating), ?? fusen (balloon), and ??? fuantei (unstable). Korean ???? Hundlpungson Combination of ??? heundeulda and a play on ?? pungseon and ? son. Mandarin Chinese ??? Piao Piao Qiú Literally "Lightly floating balloon". ? is derived from ?? Qì?qiú.